Please, join in on the simplicity! 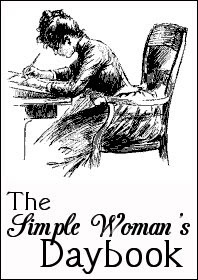 Head over to The Simple Woman's Daybook! Outside my window~ The sun is making it's glorious morning debut and my dogs are barking at everything that moves this morning. I'm sitting in front of my large kitchen window, and can see the whole backyard. Those dogs are so goofy. I can also see beautiful little buds forming on the trees! I am thinking~ the wheels are spinning that good yet! I am thankful for~ My husband and all his many, many abilities, and his love and faithfulness for me. I always know that he's got my back...without a doubt. That's the way it should be! I am wearing~ A cap sleeve burgundy babydoll shirt, and a 3 tier long black skirt. I am remembering~ How long it takes me to post this daybook! I enjoy it though. I am going~ NOWHERE today...Lord willing! Sometimes it's just good to be home! I am currently reading~ Not much, I'm really trying to put my time into our projects. I am hoping~ to finish all of our spring projects in the next two weeks! On my mind~ So many things...just keep praying for us! Noticing that~ Spring took a really long time to get here this year. I'm hoping we don't skip it and go straight to summer! From the kitchen~ Probably a chicken dish tonight, maybe with some corn bread. I've really got a plan don't I? lol I do know that I will be making tuna salad tomorrow after I finish up my natural lunch meat today. I'm really looking forward to the tuna salad...it's been a long time. Around the house~ Things are finally starting to settle down. The kids woke up in a rambunctious mood. We have some regular cleaning to do, and we have some spring cleaning projects to get back to as well. One of my favorite things~ A sunny spring morning! Great pics! I'm praying for you, especially for your son and his allergies. I know what those are like, no fun! Have a blessed week.